Databazaar’s commitment to delivering exceptional value, and superb customer service, have earned it many certifications including being named as one of America’s 75 most praiseworthy e-commerce companies by Consumer WebWatch . With Corporate Headquarters and Logistics facilities in Miramar Florida, and group companies in India and Hong Kong, Databazaar is a value added reseller of high technology and imaging supplies with customers in more than 23 countries around the world, and a dominant presence in the US market. A top class management team that oversees the Financial Operations, Logistics, Provisioning, Fulfillment, Distribution, and Marketing Operations manages Databazaar USA. 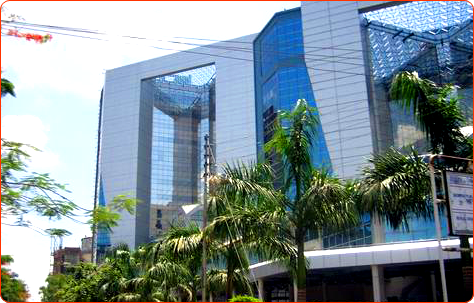 Located in the Salt Lake Electronics Complex in Kolkata, India, Databazaar has its headquarters in the landmark INFINITY TOWERS complex, a high-rise technology complex built as a showcase for connectivity and modern infrastructure. Kolkata is well connected to the United States with single connections into major US airports via London, Frankfurt, Singapore, Bangkok and Kuala Lumpur. Kolkata offers world-class hotels, dining and entertainment including Sheraton Hotels, Hyatt and many others, making it a warm and inviting destination for clients and partners alike. A world-class fully staffed office complex in a major technology center in India. Other co-tenants in our custom designed facilities include Citibank, Lexmark, AIG, and IBM. Highly secure facilities with built-in redundancies in all areas. Internet connection right from the Internet backbone eliminating last-mile issues. Dedicated in-house 5,000-line telephone switching exchange. Networked Secure VPN Access to business applications. Agent activation with accounts on your in-house system. Seamless integration with US office. Internet Technology and Advanced Communications play an intimate role in our daily operations. Our telecom gateway in the Minneapolis is integrated with our distributed web-based CRM Application that allows our customer service operations to be geographically dispersed. Our T1 communication lines can be configured with portable toll-free numbers that can be ported over from our clients or assigned by any local phone company in the US. Customer calls coming into these lines are automatically converted into internet data packets and sent via the internet to our customer service center. At the other end they are decoded and delivered to the desktop of a waiting agent to answer the customer’s call. What’s more is that the call is automatically identified and a specific screen pops up on the agents computer telling them how to handle the call. All this operation is completely transparent to the US customer. We handle thousands of these calls that allow us to process Millions of dollars in orders while keeping our customer service ratings at the top. Just another day of providing high quality customer care for our clients. Recently Databazaar.com was awarded the BizRate Circle of Excellence Gold Award for quality customer experience.